It is not a pervasive view of California he depicts. He ignores the wealthy enclaves of Hollywood and San Francisco, and the climatic diversity of the lush northern half of the state, and focuses entirely on the sunbaked sprawl of the less-affluent inland south. Volvos from the 1980s and old-fashioned trailers stand at the ready outside what would look like shabby tract houses, but for their apparent loneliness in the landscape. Yet the scenes look as though they have already been abandoned. Windows are shut with their curtains drawn, and even the tended hedges fail to suggest the human touch. Cars speed down the highway, their windows obscured to render drivers and passengers invisible. 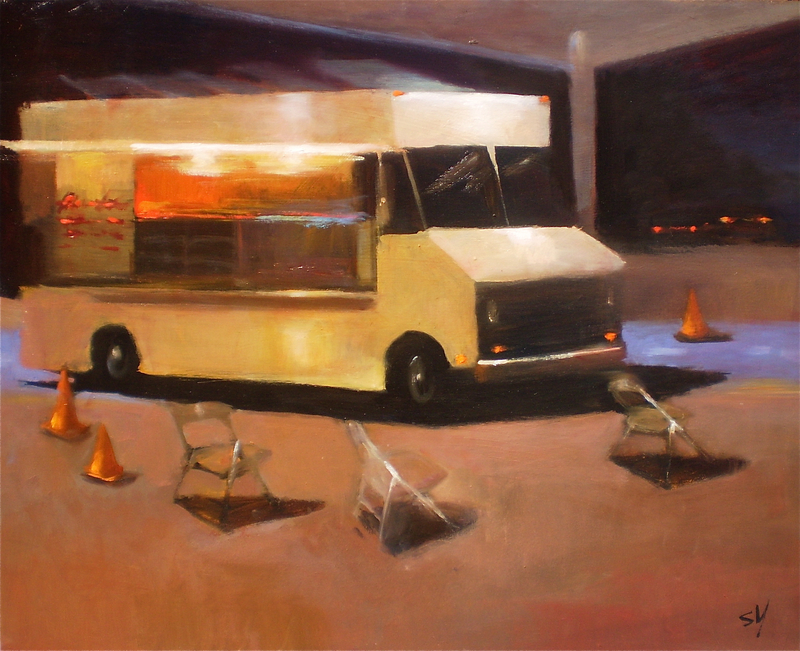 Unmanned, apparently unstocked taco trucks idle in parking lots, with a few empty folding chairs sitting unneeded nearby. The alienation is as palpable as the heat rising off the asphalt. Yeskel’s California is a place to escape, and the implication is that the exodus is already well under way. This entry was posted in ART, damn good, painting, REVIEWS, San Francisco and tagged ART, California, galleries, painting. Bookmark the permalink.